Taste test: This flavor is just one of 115 kinds of Doritos that we've reviewed. At first, they tasted sort of like regular Nacho Cheese Doritos and sort of like guacamole, but in the aftertaste there was a definite guacamole taste, slightly hot. 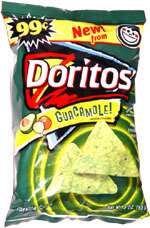 The taste was much more like a guacamole-flavored chip than a chip dipped in guacamole, but it was pretty good. You get much more actual guacamole taste with these than you do with Guacachips. Smell test: Smells slightly like guac. 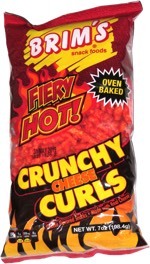 This snack was discovered by Jeremy at Flying J Travel Plaza, Lowell, Indiana. Review published .